We therefore conducted this prospective study to evaluate the impact of AKI at admission and at 48 h on survival of patients with ACLF and also the influence of reversal of AKI on survival. We also evaluated the baseline predictors of both early and late mortality in ACLF patients with AKI. This study was conducted in ACLF patients whose diagnosis was defined according to the APASL definition: “an acute hepatic insult manifesting as jaundice and coagulopathy, complicated within 4 weeks by ascites and/or encephalopathy in a patient with previously diagnosed or undiagnosed chronic liver disease”.12 Data were collected prospectively from in-patients admitted to the Gastroenterology Department, Sriram Chandra Bhanja Medical College between October 2016 and February 2018. Exclusion criteria included presence of chronic kidney disease, obstructive uropathy, hepatocellular carcinoma, and history of prior decompensation, cardiopulmonary diseases, or other malignancy. For ACLF patients at admission, AKI was defined as per the AKIN criteria.7,8 Patients were managed according to the standard of care. Patients were assessed for precipitants for ACLF and risk factors causing AKI (i.e. nephrotoxic drugs: diuretics, nonsteroidal anti-inflammatory drugs, angiotensin converting enzyme inhibiters, angiotensin II receptor blockers, vasodilators and aminoglycoside antibiotics). Intravascular hypovolumic condition (i.e. dehydration) was corrected with intravenous saline, and variceal bleeding was treated with blood transfusion and intravenous terlipressin until endotherapy was complete. Survival at 28 days was defined as the primary end-point, while that at 90 days served as the secondary end-point for our survival analysis. Duration of hospital stay was the other secondary end-point for comparing ACLF patients with and without AKI at admission. Demographic, clinical, and laboratory parameters and outcome were compared between patients with and without AKI. Normally distributed continuous variables were reported as mean and standard deviation and compared using Student’s t-test. Nonnormally distributed continuous variables were reported as median and interquartile range and compared using Mann-Whitney U test. Categorical variables were reported as proportions and compared by chi-square test or Fisher’s exact test, as appropriate. The 28-day and 90-day survival were estimated by the Kaplan-Meier method and compared by means of log-rank test. The hazard ratios (HRs) and their 95% confidence intervals (CIs) were calculated. All tests were two-tailed, and p values <0.05 were considered significant. The statistical analysis was performed using SPSS statistical package, version 20.0 (IBM Corp, Armonk, NY, USA). Ethical clearance was obtained from the Institutional Ethics Committee, Sriram Chandra Bhanja Medical College (Cuttack-753007, Odisha), Registration No. ECR/84/Inst/OR/2013. We included 439 participants (372 males, 84.76%; 67 females, 15.24%) in the study. Of these, 113 (25.7%) patients had ACLF as per APASL criteria. Of the 113 ACLF patients, 78 (69%) had AKI as per AKIN criteria (Fig. 1). Table 1 shows the comparison of baseline characteristics of ACLF patients with and without AKI. ACLF patients with AKI and without AKI were comparable for age [mean age of patients 44.50 ± 9.19 vs. 48.14 ± 11.22; p = 0.073]. Among the etiologies of underlying chronic liver disease in the ACLF patients, alcohol was the predominant etiology, followed by viral hepatitis B or hepatitis C (Figs. 2 and 3). 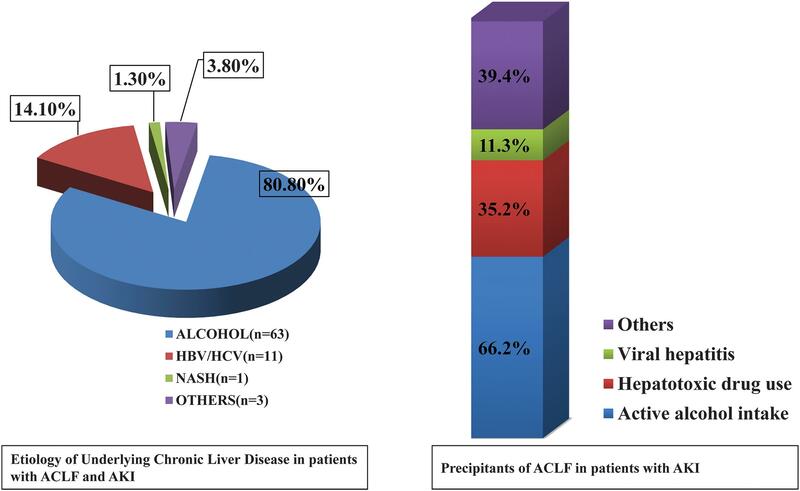 Active alcohol intake was the most common precipitant in ACLF patients (60.2%) as well as in ACLF with AKI (66.2%), followed by hepatotoxic drug use, variceal bleeding and viral hepatitis (Fig. 4). Fig. 1. Schematic flow diagram for the study. Data are presented as mean (standard deviation), median (interquartile range), or frequency (%). Abbreviations: ACLF, acute-on-chronic liver failure; AKI, acute kidney injury; BMI, body mass index; CTP, Child-Turcotte-Pugh classification score; INR, international normalized ratio; MAP, mean arterial pressure; MELD, model for end-stage liver disease; SAAG, serum-ascites albumin gradient. Fig. 2. 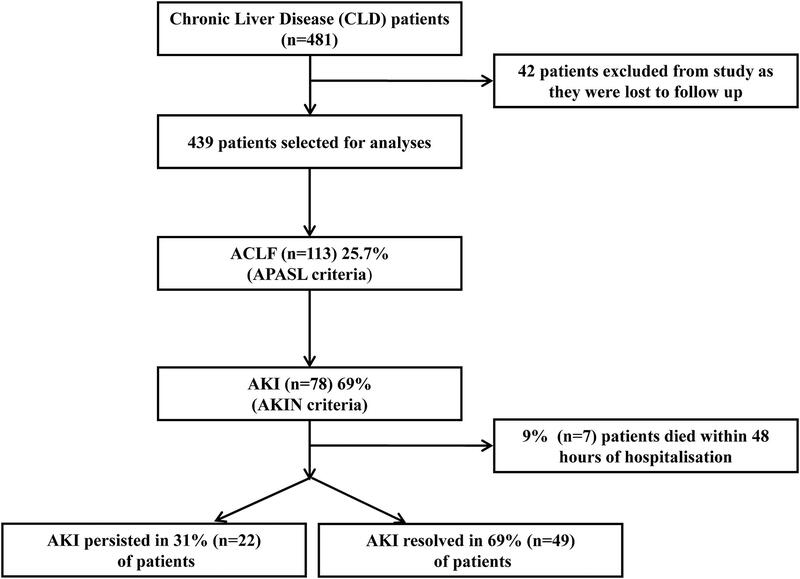 Etiology of underlying chronic liver disease and the precipitants in ACLF patients with AKI. Fig. 3. Kaplan-Meier survival curves comparing survival at day 28 for participants with ACLF with and without AKI at admission. Fig. 4. 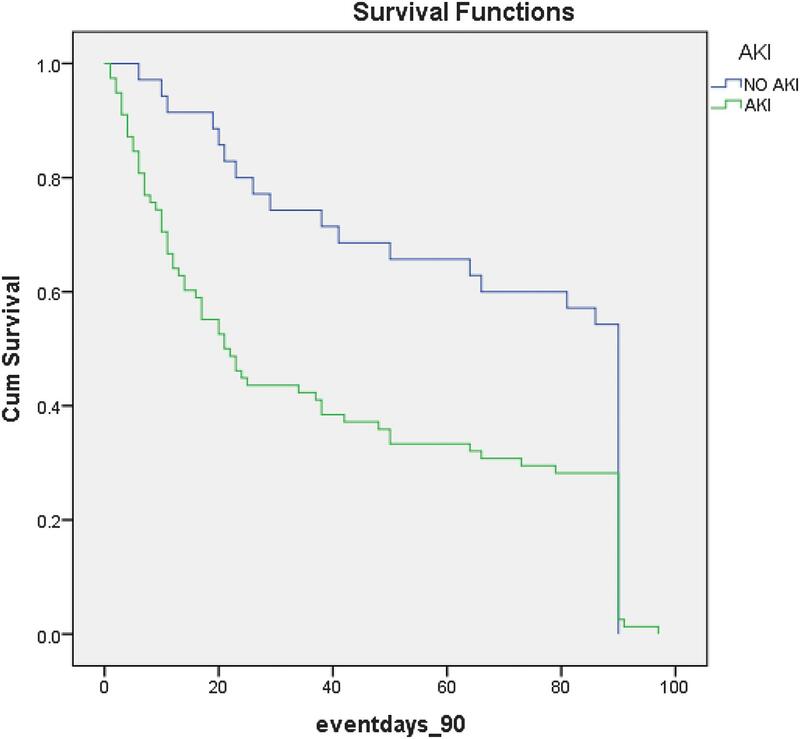 Kaplan-Meier survival curves comparing survival at day 90 for participants with ACLF with and without AKI at admission. At admission, AKI was found in 78 (69%) patients (males = 74; females = 4). Admission serum creatinine for AKI patients was 1.90 (interquartile range: 1.48–3.02) versus 0.80 (interquartile range: 0.70–1.00) mg/dL (p < 0.001) in ACLF without AKI. Significant differences were noted in admission serum urea level [56.00 (interquartile range: 35.25–91.50) vs. 22.00 (interquartile range:17.00–25.00) mg/dL; p < 0.001], model of end-stage liver disease score (UNOS) (33.10 ± 8.03 vs. 22.60 ± 2.81; p < 0.001), model of end-stage liver disease score (Na+) (34.25 ± 6.56 vs. 25.92 ± 3.16; p < 0.001), duration of hospital stay (6 vs. 5; p = 0.002) days, 28-day survival (44.9% vs. 74.3%; p = 0.004) and 90-day survival (25.6% vs. 51.4%; p = 0.007). 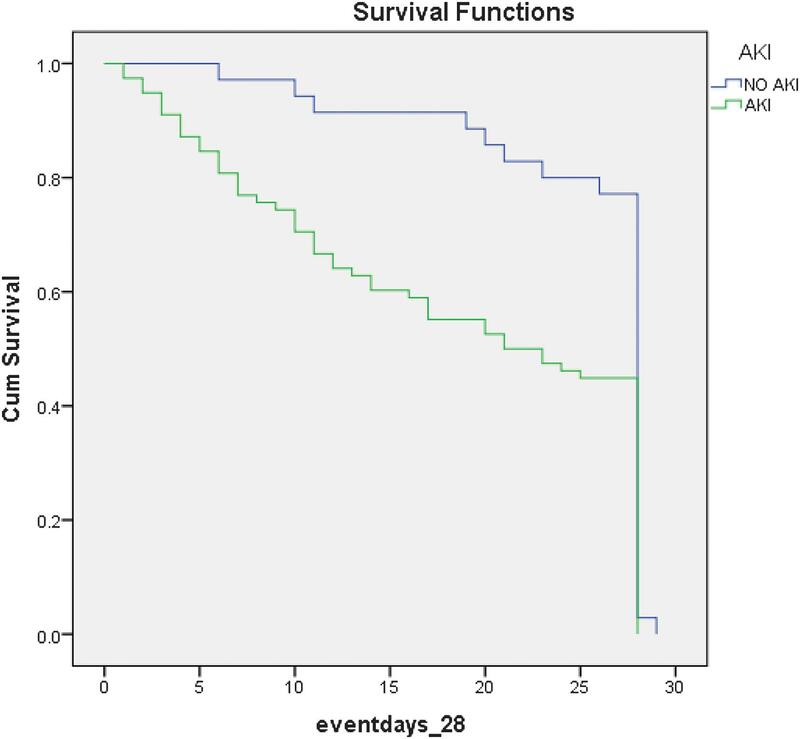 Kaplan-Meier survival curve showed significantly decreased survival in AKI patients both at 28 days and 90 days (log-rank p values of 0.001 and 0.004) (Figs. 3 and 4). On Cox regression analysis (univariate), hazards of mortality were significant with admission serum creatinine, urea, sodium, bilirubin and international normalized ratio. But on multivariate analysis, the independent predictors of mortality at 28 days and 90 days were urea, bilirubin and international normalized ratio (Table 2). Abbreviations: ACLF, acute-on-chronic liver failure; AHR, adjusted hazard ratio; AKI, acute kidney injury; HR, hazard ratio; INR, international normalized ratio. The recent AARC study had concluded that AKI persistence at 48 h predicted worst outcome in patients with ACLF, thereby indirectly underplaying the importance of AKI at admission. This study from AARC gives a false impression that recovery of AKI at 48 h perhaps dramatically improves the outcome and survival. Our present study provided us an opportunity to critically examine this very issue, particularly the questions: How important is AKI at the point of hospitalization for ACLF patients? And, did reversal of AKI at 48 h improve the outcomes in these patients? Our study showed that, while ACLF patients had significantly decreased early (28 days) and long-term (3 months) survival (Supplementary Table 1), AKI, which was present in 69% of the ACLF patients, further affected the survival of patients, both short-term and long-term survival (Table 1). Unlike the AARC study by Maiwall et al.11 our study clearly showed that notwithstanding AKI at 48 h, AKI at admission itself was associated with equally poor prognosis. Besides, around 10% (n = 7) of patients died within 48 h of hospitalization (Table 3), and when comparison was made between AKI persisters and reverters, the survival was comparable both at 28 days and 90 days. Despite recovery from AKI, one-fourth of patients died by 28 days, and more than half by 90 days. This suggests that in ACLF patients, AKI at admission is a better prognostic indicator than AKI at 48 h.
Seven ACLF with AKI patients died before 48 h.
Survival comparison at 48 h between AKI reverters versus ACLF patients without AKI at admission. Abbreviations: ACLF, acute-on-chronic liver failure; AKI, acute kidney injury. In our study, the median time of reversal of AKI in ACLF patients was 4 (range: 3–6) days. So, waiting for 48 h to see if there is reversal of AKI in these patients is not a worthwhile proposition, as it could delay intervention and prognostication of these patients. The published paper from the AARC study16 states, “AKI persistence at 48 h predicts mortality in patients with [ACLF]”. The authors looked at the status of AKI at different time points with respect to day 1 and prediction of 1-month mortality, and they found increased odds ratio (OR) at day 6 (OR: 4.4) versus day 2 (OR: 3.7). However, surprisingly, they preferred day 2 instead of day 6, to enable early intervention. In our study, since we found that admission AKI was as important as AKI persistence (at 48 h), we preferred to highlight this as a better prognostic predictor rather than delaying for 48 h to enable early triaging and intervention. So, without waiting for 48 h, patients with ACLF and AKI should be prognosticated from the beginning to enable early decision making regarding further intervention including liver transplantation. Our study has a few limitations. It includes data from a single, resource-constrained region, and it might not be appropriate to extrapolate our conclusions regarding outcome to the population of other regions across the globe. Besides, the study also needs validation from other multicentric studies with larger sample size. Over one-fourth of DC patients had ACLF, and more than two-thirds of them had AKI. Presence of AKI in ACLF decreases both 28- and 90-day survival rates. AKI at admission is an important prognostic indicator. Strategically, AKI at admission is a more important prognostic indicator than AKI persistence at 48 h.
Contributed to the study design, analysis and interpretation of data, statistical analysis and manuscript writing (CRK, SPan, DM, SPra, SKS, RKB, PKP, SB, SPar, SPS).